Humor reduces stress: It is believed that laughter works by relieving stress, which is implicated in so many negative impacts on our health. Laughing can help relax muscles, lowers blood pressure and increase the oxygen level in your blood. When you laugh, you are stimulating the immune system, counteracting the negative effects of stress. Humor makes you feel good: Having a sense of humor can have a positive impact on the perception of pain. It benefits the immune system, and has proven to benefit heart health. Laughter helps keep our blood vessels healthy, reduces the serum cortisol levels in the blood, increases the T-lymphocytes (T-cells) in the body, and improves cholesterol levels. Humor has clinical benefits: Studies over the last five years have produced findings that suggest humor can have clinical benefits and positive rehabilitative implications. 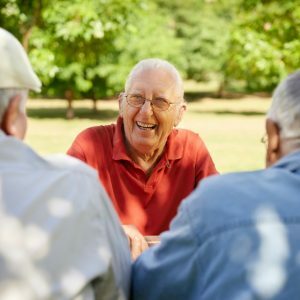 Older adults may have age-associated memory deficiencies, that when humor is applied to various therapies, the results have shown improved learning ability, short-term memory, and delayed recall which in turn has improved their quality of life. Humor is good for the brain: Humor is a great way to give our brains a good workout. A good laugh can be a highly developed mental exercise that trains us to approach aging and the ideas of aging in different, inventive ways. Researchers say that even the lowly pun requires the brain to shift perspective. Need a laugh? Check out FirstLight Home Care’s Pinterest board, Ageless Humor, and get ready to cast away any negative attitudes you have towards aging.